The following story originally was published on July 7, 2017 in the Messenger. Messenger photo by Joe Sutter Ed Fallon, at right, speaks at a press conference with pipeline protesters during a break in the trial of protester Heather Pearson, in front of the Freedom Rock at the Calhoun County Courthouse. 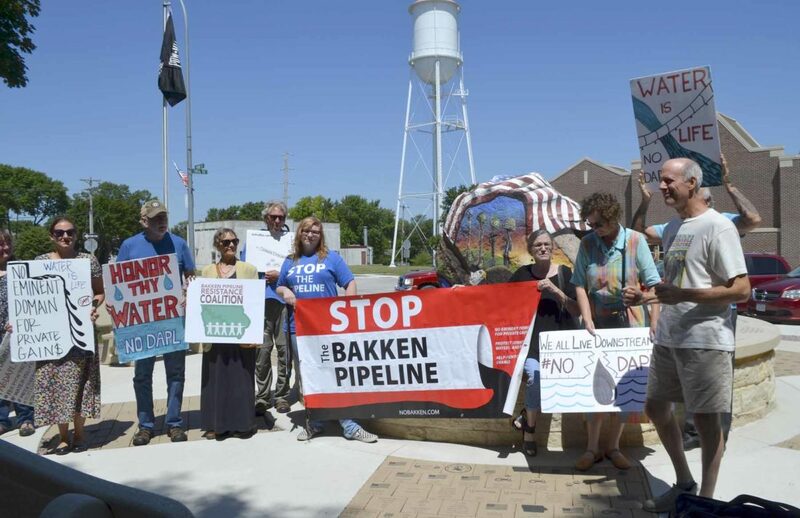 ROCKWELL CITY — A pipeline protester has been found guilty of trespassing after a jury trial in Calhoun County Thursday. Heather Pearson, of Logan, was one of the protesters who entered land being worked on by Dakota Access LLC on Oct. 29, 2016, as the company was building an oil pipeline across four states, including Iowa. Although she admitted being on the land, Pearson and her defense attorneys claimed she was justified in being there due to what they called a climate emergency. The land east of Rockwell City located near the corner of County Roads N65 and D35 is owned by Shirley Gerjets, who opposed the pipeline company’s presence there. 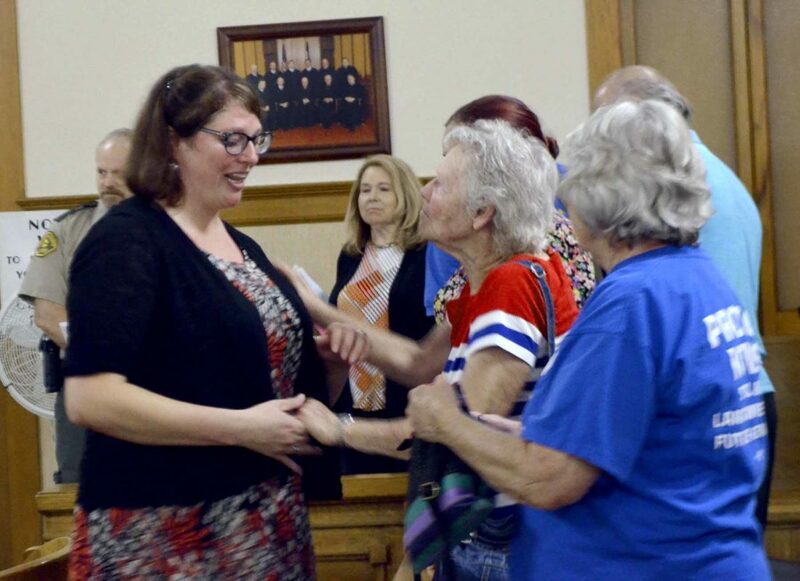 Although the court officially recognized the threat of global climate change to Iowa, and Pearson’s defense relied on that issue and questions of eminent domain rights, the two men and four women of the jury seemed to agree with Calhoun County Attorney Tina Meth-Farrington, who said none of that was relevant. “This is not an opportunity for you to pass judgment on whether or not eminent domain was right and proper. That’s for another time and another body,” Meth-Farrington said. “This is not a time for you as jurors to make a statement on climate change. That has absolutely nothing to do with whether she had a right to be there. -Messenger photo by Joe Sutter Heather Pearson, left, hugs Shirley Gerjets after Pearson was found guilty of trespassing during a protest of the Dakota Access Pipeline on Gerjets’ land. Pearson pled not guilty, claiming Dakota Access had no right to be working on Gerjets’ land. Dakota Access, a Texas-based subsidiary of Energy Transfer Partners, now has completed its pipeline which stretches about 346 miles across Iowa. It was granted the use of eminent domain by the Iowa Utilities Board, to gain easements from landowners like Gerjets who refused to sign voluntary easements. Pearson said she will consider appealing the decision. Defense attorney Channing Dutton, of Lawyer, Lawyer, Dutton & Drake, LLP, hoped the jury would consider that. “Big oil came into this community and other communities and they ram-rodded it through,” Dutton said. “They pushed it, and they pounded it, and they turned soil. They ruined that soil for generations. They put her water in jeopardy. Calhoun County Magistrate Andrew Smith agreed with the state’s recommendation, and gave Pearson the minimum fine — $65, or $212.75 after surcharges, plus court costs. The maximum allowable penalty would have been 30 days in jail and a $300 fine. It is significant, according to Dutton, that the court took judicial notice of the Iowa Department of Natural Resources’ official position on the dangers of climate change. That notice means the position was accepted into the record as a fact, as far as the court was concerned, Smith said. Dutton said it’s significant because such a statement hasn’t been taken under judicial notice by an Iowa court before. The DNR advises that Iowa is already experiencing the effects of climate change, including extreme precipitation events that lead to flooding and increased spread of pests and pathogens. Landowners and environmental groups who claim the IUB shouldn’t have granted eminent domain currently have an appeal before the Iowa Supreme Court, after losing their case in Polk County District Court in February. Assistant Calhoun County Attorney Ben Meyer prosecuted the case and conducted examinations during the trial. Two other pipeline protesters have already pleaded no contest to trespassing in Calhoun County, and two more are awaiting trial, Meth-Farrington said. ← Join Us to Give Keystone XL The Boot!